Makers from Chambana area firms Pixo Tech and Taylor Studios converge on to the Illinois MakerLab to learn about 3dPrinting. This visit was a result of the MakerLab presentation to the Champaign County EDC board earlier in January, where the founders of both companies were present We look forward to some interesting projects with Taylor Studios as a follow up to this meeting. Read about other visitors to the Lab and about our outreach activities. MakerGirl, a University of Illinois student venture, launched a pilot session of its program on Tuesday, December 2 in the Business Instructional Facility’s MakerLab. The project was co-founded by Lizzy Engele, Julia Haried, Sophie Li, and Emily Woodward this fall in Professor Noah Isserman’s Social Entrepreneurship class. MakerGirl aims to use the MakerLab’s innovative space to open their minds to the world of technology, with the goal of inspiring young women to pursue STEM (Science, Technology, Engineering, and Math) fields, . Winnie Yang, a Guru at the Lab, who studies Material Science Engineering at the University, led the MakerGirl session of seven girls aged 7-10 through the process of creating bracelets with the MakerLab’s 3D printers. The session included educational segments about trans-formative 3D printer technology, the significance of STEM fields, and notable female role models. Parents also attended the event in order to encourage and support their children in the pursuit of these fields. The goal of this program is that by 2025, all STEM majors have a girl to boy ratio of 50/50. Our “Making Things” class was excited to host Alex Mitchell for the past two weeks. Alex(@MarketTheory) is a PhD candidate at Queen’s University in Ontario, Canada and is researching how 3D printing in specific and the hackerspace movement in general is impacting both academics and business. This sharing orientation fits well with the mission of the Makerlab and the credo of our class – “Learn, Make, Share.” Alex was present to see how many of our ideas are in the final stages of prototyping and are beginning to come together in preparation for the end of the semester. During his 10-day visit to our Lab, Alex interviewed all of our Gurus as well as several of our users, attended a number of events, including the recent Hack Illinois, and did some 3D design and printing of his own. Thanks for visiting, Alex! MakerLab hosts several CU area schools. There is tremendous interest in 3D printing across industry today and in schools as well. We are pleased to host several free tours/workshops for area schools, in line with the university's mission for public engagement and outreach. We were pleased to host students from Chrisman High school, led by Michael Davison, the Business Education/Technology Coordinator. The visit was hosted by our Guru, Ryan Hurley, a Material Science Major. One of the students shared their experience at the lab. Chrisman High School Computer Club had the opportunity to attend an introductory workshop at the Maker Lab. During the workshop, we were able to view a video showcasing the potential power 3-D printing offers. We were also given an explanation of the material engineering field. 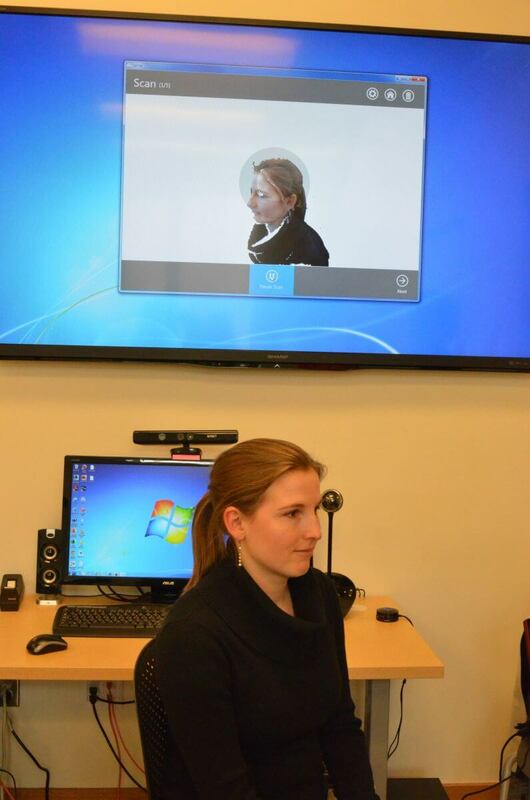 In addition, we were able to scan our teacher to build a template from which a 3-D model could be made. To conclude, we searched databases of printable 3-D objects. Practical, cost-affordable, and creative are just a few of the many parting thoughts we had as we reflected on our experiences of the Maker Lab. By visiting the Maker Lab, we were able to gain an insight into the manufacturing industry and a unique look at the opportunities the University of Illinois can afford. Students from University high school, joined us during the Agora Days annual Spring event, after working on products created by merging geometric shapes with OpenScad at our partner lab, IGL, with Noel Dejarnette. This visit was hosted by our Guru, Jeremy Copley, an Architecture Major. Earlier in the year, we hosted middle school students from Countryside School in Champaign, in partnership with Illinois Geometry Lab. It turns out that this technology appeals to a much younger audience too. We look forward to hosting Cub Scouts from 1st to 4th grade from Monticello on April 3rd. If you are interested in organizing class visits to the lab, drop us a line at uimakerlab AT illinois DOT edu. If you are interested in summer programs at the Lab, we will be available to meet at the Champaign Public Library event to support Home School families. Details on the workshops will be finalized by middle of april. Sign up for alerts from our Blog by email, or connect with us on twitter or Facebook to get updates. Last week, Ms. Zielnicki's 8th grade class from Countryside School in Champaign visited the MakerLab. This visit was organized in partnership with the Illinois Geometry lab. The students had a workshop using OpenScad at IGL, before visiting the lab. 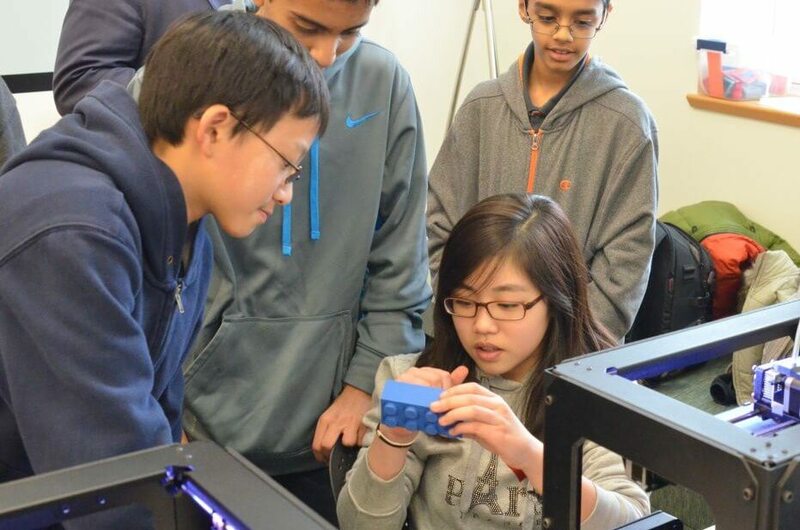 During their time in the lab, the students learned how to operate our MakerBot Replicators, printed conic sections and engaged in 3D scanning using our Sense scanner. The students were "blown away" by the experience. This type of outreach activity is an important part of our mission and we enjoyed hosting these students. If your class would like to visit our lab and learn about the emerging maker movement, just ask your teacher to contact us at uimakerlab AT illinois DOT edu. Ping Fu, Vice President and Chief Strategy Officer at 3D Systems and a former researcher at the University of Illinois, recently visited the MakerLab. She was quite intrigued to hear about a 3D printing lab in a Business School. She brought along some examples of amazing 3D printed objects, such as a pink scarf that retains body heat and a customized multi-colored bracelet. She gave some valuable advice to our Guru's Ana and Ryan, and challenged us to look beyond the technology behind 3D printing which is increasingly becoming commoditized. Instead, she asked us to focus on helping students develop business models that are scalable. As it turns out, we are working on exactly that, by offering our new "Making Things" class next spring, where students will acquire the skills to create and market 3D printed objects. Here are some pictures of her visit.